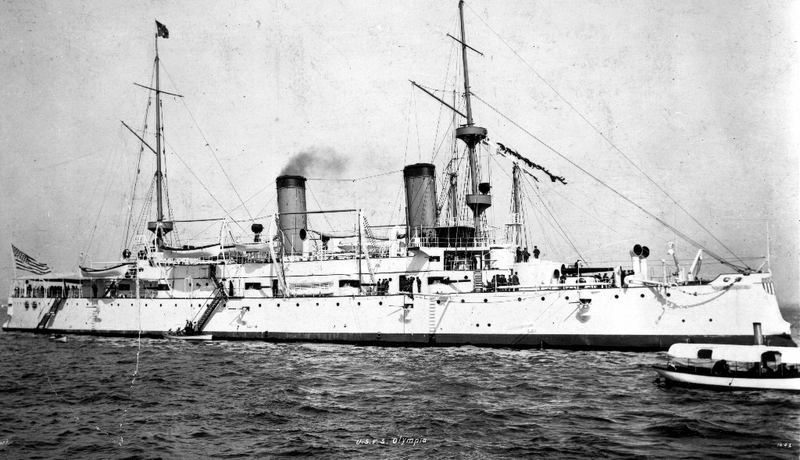 USS Olympia C-6 in 1899 flying the four-star flag of Admiral George Dewey. The 5"/40 (12.7 cm) guns are in the superstructure casemate mounts. Olympia was later rearmed with 5"/51 (12.7 cm) guns. U.S. Navy Historical Center Photograph # NH 2894. This was the first USN Rapid Fire (RF) gun and it was used mainly for battleship and cruiser secondaries. 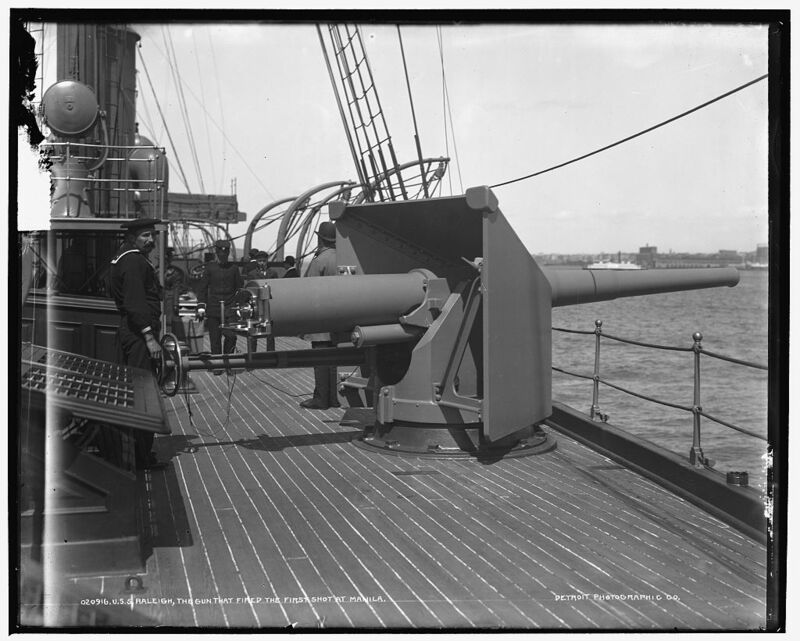 The Mark 2 guns were too lightly built, with USS Brooklyn (ACR-3) having two of her guns bulged at the muzzle following the Battle of Santiago in 1898. As a result, the follow on Mark 3 and Mark 4 were designed with a stronger muzzle bell. 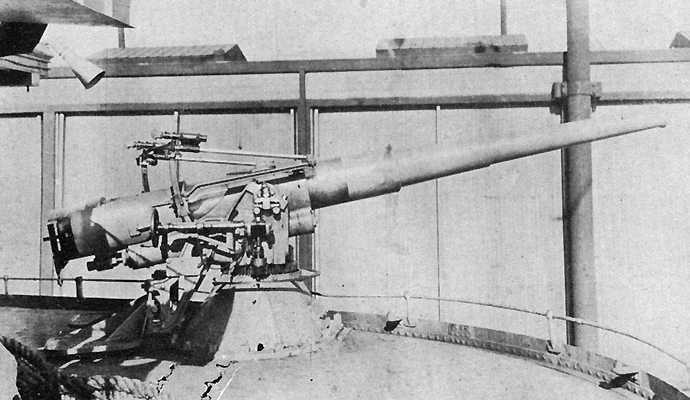 Many of these guns were later modified to use the Dashiell breech mechanism, a three-motion breech that could be controlled by a single lever. Mark 2 was constructed of tube, jacket and two hoops. Mark 3 was nearly the same with some minor differences in the recoil cylinders and a larger muzzle bell. Mark 4 was similar to the Mark 3 but with a modified groove for the yoke. One of the Mark 3 Mod 3 guns was cut down to 25 calibers and used to test anti-aircraft concepts at the proving grounds. This led to the later development of the successful 5"/25 (12.7 cm) Mark 10 AAA weapon. Data from "U.S. Armored Cruisers" and is for KNC armor. ^The center-pivot mountings were difficult to adjust and had considerable amounts of bronze in their construction. Many of these were replaced in the early 1900s with new pedestal mounts, which were of all-steel construction and far stronger. 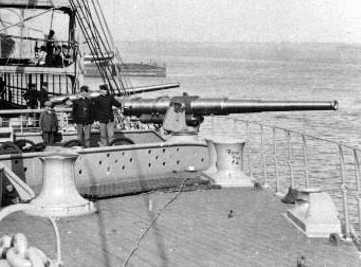 For example, in 1901 at Cavite, Philippines, twelve new 5"/40 (12.7 cm) guns and their pedestal mounts were installed on USS Brooklyn (ACR-3). ^Mark 5 had an improved recoil system and a telescopic gun sight. This mount put the elevating and training gear in the hands of the gun captain rather than with separate pointers. 5"/40 (12.7 cm) guns aboard Auxiliary Cruiser USS Saint Paul in 1898. These are in Center-Pivot mountings. U.S. Naval Historical Center Photograph # NH 89086. 5"/40 (12.7 cm) gun aboard USS Henry R. Mallory (ID-1280) in 1918-1919. This appears to be one of the later Pedestal mountings. U.S. Naval Historical Center Photograph # NH 103295. Gunner Shaw and his 5" (15.2 cm) gun on USS Raleigh (C-8). This gun is credited with firing the first shot during the Battle of Manila Bay in 1898. Detroit Publishing Company Collection Photograph. Library of Congress Photograph ID LC-D4-20916.